Rip Van Winkle; or, The Sleep of Twenty Years by Dion Boucicault. The famous American actor, Joseph Jefferson, played Rip. SCENE FROM "RIP VAN WINKLE," AT THE ADELPHI THEATRE. 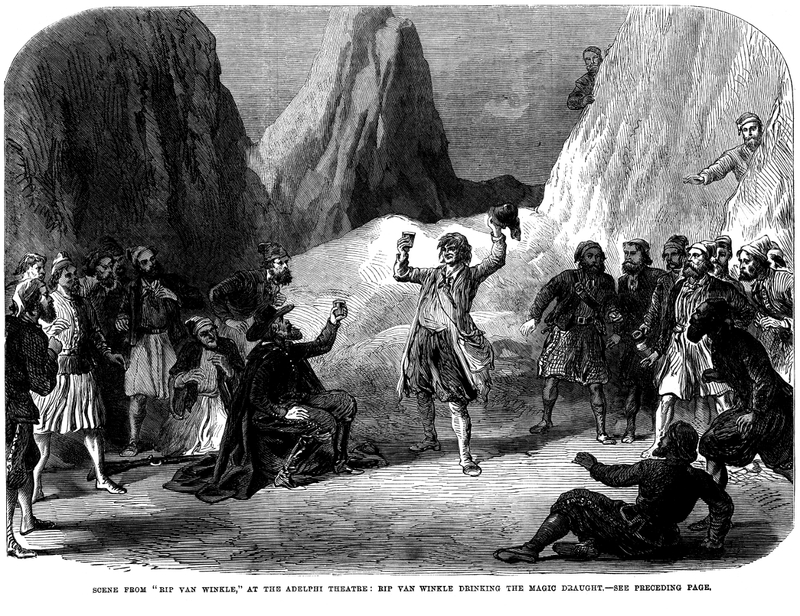 The new play of "Rip Van Winkle," a dramatised version, by Mr. Dion Boucicault, of Washington Irving's most genial and humorous story--in which, the hero, one of the early Dutch settlers in New York, falls in with the goblins who haunt the Katskill [sic] mountains, and drinks their magic liquor, causing him a sleep of twenty years--is likely to have a long run at the Adelphi Theatre. The new American actor, Mr. Jefferson, who appears as Rip Van Winkle, seems as though he had created the character himself, so perfectly does he enter into the author's conception of the loose-lived, lazy, lounging fellow, who lets his wife turn him out of doors and then becomes the victim of the mischievous imps, with the ghost of the old pirate, Hendrik Hudson, at their head. Our illustration shows the scene in which poor Rip Van Winkle is compelled to quaff the fatal potion.